As Meryl Streep receives critical acclaim for her performance as the Witch in Disney’s adaptation of Into the Woods, I was reminded of the first film I ever saw with her – Kramer vs. Kramer. 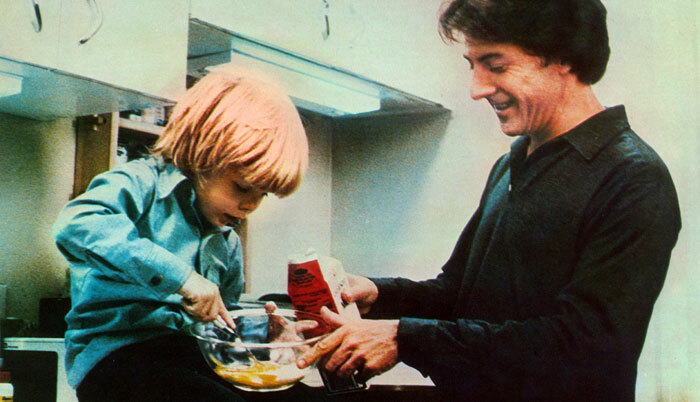 I was very young when I first saw Kramer vs. Kramer, but what stayed with me was the little boy’s bedroom with clouds painted on blue walls and ceilings and his accident. It was only years later when my mum asked me if I’d seen it, that I remembered that I had, but watching it again as an adult was quite a different experience. It is a beautifully sad film with incredible performances from each actor, something recognised by the fact that it won 43 awards and was nominated for a further 17. Ted Kramer (Dustin Hoffman) has just landed the biggest deal of his advertising career, but his wife Joanna (Meryl Streep) has had enough of her workaholic husband and leaves him to care for their son Billy (Justin Henry). Ted must now learn to be a housekeeper and single parent while continuing to deal with the pressure of work. As he tries to rebuild his life he loses his job but realises that his son is more important. When Joanna returns and demands her son Ted must prove that he is the most suitable parent for Billy or risk losing him. The film is heart-breaking from start to finish as we watch Joanna tell Billy she loves him before telling Ted she’s leaving them. We then see poor Billy devastated that his mother has left him and confused by why things have changed. In fact the film doesn’t get much happier for quite some time. When Billy ends up in hospital because of a playground mishap we finally see a true bond between father and son, which tugs at the heartstrings, making Joanna’s decision to come back even worse. Streep and Hoffman are exceptional and I’ve never despised a character so much in a film, only to then feel sorry for her when she finally does the right thing. Watching Hoffman create a new life for him and his son is lovely to watch, but the arguments between dad and son are staged with perfect comic timing. However, Justin Henry is the one to watch. Just eight years old, he is at times precocious, but captures his character’s emotions perfectly. The hospital scene is traumatic and is every parent’s nightmare but watching Dustin running down the street clutching his child is extremely touching; he then tells the court about this and his painful memory is clear from his expression and tone of voice. Not many films manage to make me cry, but this one always gets me. I don’t know if it’s the music, which is a beautiful adaptation of Sonata for Trumpet and Strings: 2. Adagio 3. Presto but the whole film is so packed with differing emotions that your own are confused. Almost 40 years after this film was released, Kramer vs. Kramer is still a fantastic film, perhaps because the messages within the film are still just as relevant to the audience of today.